Gerald Finley, has just received a 2008 Gramophone Award for a recital of songs by Barber. This imaginatively conceived recital, recorded in October 2007, brings together works by Tchaikovsky, Musorgsky – the quintessentially Russian Songs and Dances of Death – and Ned Rorem, born in Indiana in 1923; it also includes encores by Charles Ives, Einojuhani Rautavaara and Charles Wolseley. 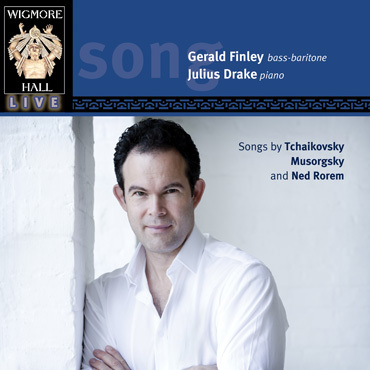 Hilary Finch, speaking on BBC Radio 3’s CD Review programme, described this recital and CD as “Gerald Finley in his prime – I think he’s never sung better than he’s singing now”, and chose it as her favourite CD of 2008. In the same programme, Rob Cowan spoke of Julius Drake as “marvellous – the things he was finding in the piano part of that song I don’t think I’ve ever heard anybody bring out so much in Musorgsky’s piano writing”. This polished recital, recorded live at Wigmore Hall last October, is mostly taken up with Russian song. In seven works by Tchaikovsky, which include an emotionally sophisticated take on None But the Lonely Heart (here called Only One Who Knows Longing) and a beguiling performance of The Mild Stars Shone for Us, Finlay offers an extraordinary array of rich colours that inevitably turn darker for Musorgsky’s Songs and Dances of Death, chillingly delivered. He follows this with something American: Ned Rorem’s 1969 anti-Vietnam cycle War Scenes, declamatory settings of prose texts by Walt Whitman, making a powerful case for this still pertinent work. But darkness turns effortlessly to light with his beautifully delivered encores, pieces by Charles Ives, Einojuhani Rautavaara and Wolseley Charles.